Fighting for Zachary: 26 Wks, 1 Day: Brothers Fighting Already? Baby Zachary's amazing little kicks and squirms are getting stronger by the day. A true reflection of what is going on in my uterus, they tell me he is okay. If I go for any length of time without feeling them, I start to secretly worry about him. There is nothing like feeling him kick. Nothing. Relief washes over me with each nudge from his little arms and legs. And love does also. My baby. I can already tell how cute and sweet he is, how amazing he is sure to be. He's my Zachary. Lately his kicks are strong enough to see. J has been able to feel them from the outside for some time, because he has felt it before with E and knows what he is looking for. They would have to be pretty pronounced for E to be able to feel them. Now is the time. As I was sitting on the sofa one day, I felt him kicking up a storm, and had E come over and put his little hands on my belly. Nothing. E's little face fell in disappointment. He could have waited and he would have felt Zachary kick, but he is a busy little boy with his own agenda, and didn't want to sit and wait. Yesterday, I was laying on the bed and E came up and kissed my bare belly. Then. Right at the perfect moment, and in the perfect spot. 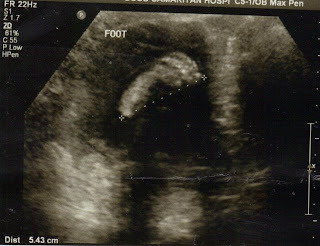 Zachary kicked where E's little face was located. E felt it on his cheek. He gave a little surprised gasp, and looked at me with the most priceless look of shock on his face. "Was that him?" he asked. "Yep", I said. It made his day. He laughed as he told Daddy that Zachary kicked him in the face. Now,before he does anything, he wants to kiss his baby brother in the hopes that he will feel Zachary again. He is truly going to be an awesome big brother. And it makes me kind of sad that we didn't have them closer together in age, that there will be an almost 9-year gap between the two of them. Will they still find a way to be close, or did we rob them of that?